While most creatures are busy in fall preparing for a dormant winter, hemlock woolly adelgids in Michigan are just waking up from a summer siesta to begin feeding on hemlock trees. These tiny, invasive aphid-like insects from Asia consume a hemlock’s stored nutrients, slowly sucking the life from the tree. As they feed, adelgids secrete a white, waxy material that creates “ovisacs.” The presence of these small, round, white masses makes it possible to identify infested trees. The Michigan departments of Natural Resources and Agriculture and Rural Development have confirmed hemlock woolly adelgid infestations in areas of Allegan, Muskegon, Oceana and Ottawa counties in southwest Michigan. A coordinated survey effort in these and surrounding counties to determine the extent of the infestation includes staff from MDARD, the DNR, the Ottawa Conservation District, The Nature Conservancy, Michigan State University, Ottawa County Parks and regional cooperative invasive species management areas (CISMAs). Now these partners are asking for the public’s help in looking for and reporting signs of hemlock woolly adelgid. Because adelgids are active in the fall, now is an important time to take a close look at hemlock trees in yards, parks, or hunting or fishing areas that you visit. Cone- or g-shaped trees up to 75 feet tall. Flat needles growing individually from the sides of twigs. Needles that are dark-green on top with two parallel, white stripes underneath. Papery cones about three-quarters of an inch long that hang downward from branches. Most of Michigan’s 170 million hemlocks are found in beech-maple forests, coniferous swamps, forested dunes and river corridors, mainly along the Lake Michigan shoreline and in the northern Lower and Upper peninsulas. 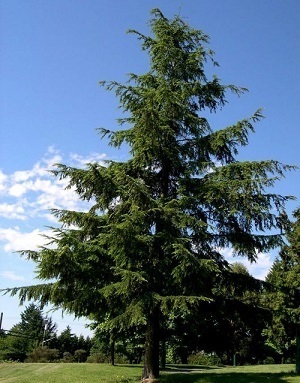 Due to their popularity as a landscape tree, hemlocks also are found in residential areas, parks and developed areas throughout the state. Late fall through early spring is the best time to check hemlock trees for the presence of hemlock woolly adelgid. Look on the undersides of branches for evidence of round, white ovisacs near the base of the needles. Up close, ovisacs look like balls of spun cotton and may appear alone or in clusters. The short video Hemlock woolly adelgid: invasive species in Michigan provides helpful identification tips. Other, less damaging pests easily can be mistaken for hemlock woolly adelgid. Be sure to review photos and descriptions of common hemlock woolly adelgid look-alikes at www.michigan.gov/HWA. Trees infested with hemlock woolly adelgid should be reported using the Midwest Invasive Species Information Network (MISIN), available online at www.misin.msu.edu or as a downloadable smartphone app. Reports can be made by email to MDA-Info@michigan.gov or by phone to the MDARD Customer Service Center at 800-292-3939. Be prepared to report the location of infested trees and, whenever possible, take one or two pictures of infested branches to help confirm identification. To avoid spreading hemlock woolly adelgid, do not collect sample branches or twigs. The MISIN smartphone app will take a GPS location point if a report is made at the site; it also will allow you to upload photos with a report. 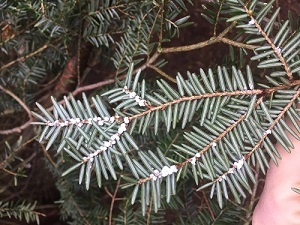 If you find hemlock woolly adelgid on your property, it is important to know that certain insecticides are successful in treating the infestation if used correctly. Without treatment, infested trees can die within four to 10 years. A qualified arborist, such as one certified by the International Society of Arboriculture, can diagnose and assist with treating infested trees. If you are able to handle treatment on your own, follow the guidance provided in the MSU Extension Bulletin: How to treat hemlock trees for hemlock woolly adelgid. Reporting infested trees, even if they are on private property, is important to help determine how far hemlock woolly adelgid has spread. This information also indicates where additional surveys may be needed. For more information on hemlock woolly adelgid identification, reporting or treatment, visit the Michigan Invasive Species Program’s hemlock woolly adelgid page at www.michigan.gov/HWA. Photos are available for download below. Caption information follows. Hemlock tree: Hemlock trees are generally cone-shaped with lacy or feathery branches. Healthy branch: Hemlock needles grow from the sides of stems, giving a flattened appearance to each twig. 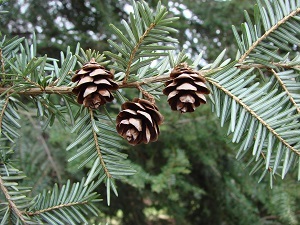 Cones are small and papery and hang downward. Infested branch: Round, white hemlock woolly adelgid ovisacs are found on the undersides of branches near the base of the needles.